Producing buildings takes a high time investment but will identify your layout. 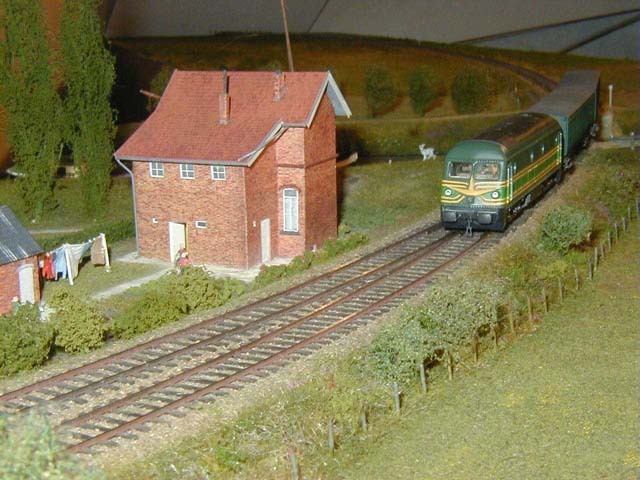 In building a railway model of a historical or still existing situation you are in general bound to copy a multitude of railway related buildings. There exists many methods and working materials. Most common are probably the use of printed brick paper to clad walls or the counter version in the form of moulded plastic sheet. For N-scale these materials often have drawbacks in that the commercially available artwork is nowhere near scale or having an entirely wrong bonds or just awful printed colour. The enterprising modeller however can overcome these drawbacks with the current range of tools offered by modern computer systems. In the paper card option there now exist laser cutting techniques that are capable of producing your own kit in single quantity for a very acceptable price or you can choose to print the design entirely at home on a good quality inkjet printer. Using etching techniques you can produce the artwork either directly to be used as etches or indirectly as masters for specific castings. Using simply cold curing resins enables you to produce your own wall sheet. Of course the old methods of doing buildings using plain sheet or by hand engraving and imprinting material still work in this century. A small selection of these methods using different techniques for the various buildings on my layouts are illustrated in this section. A small cottage along the line produced from commercially available paper.